As an ever-increasing number of children spend substantial time in daycares and preschools, alert music and movement specialists know that in order to serve them best we need to work within childcare institutions and build the best possible relationships with the caregivers. Some institutions are willing and able to bring their specialists in weekly, though, too many choose bi-weekly or even monthly. No matter how frequently we visit, we realize that we depend on classroom teachers to generalize music and movement activities between our visits. The children need to participate in music and dance every day, not every week, let alone once a month. Each of us explores our own methods for gaining classroom teacher buy-in and helping them feel self-confident as music activity leaders. For the past fifteen years, published research has also been addressing the same question: what does it take to put classroom care providers in position to lead music and movement activities effectively? de l’Etoile (2001) was able to increase children’s visual, vocal, and physical engagement as well as caregiver attitudes through an interactive in-service training. Haycock and Robinson (2001) urged music specialists to link their in-service support directly to the curriculum and standards that the caregivers are already using. In 2004, Dena Register, Ph.D., a nationally respected music therapist as well as ECMMA member, took further important steps towards identifying best practices in this arena. In the following study, Dr. Register offered workshops for three groups of childcare providers. The groups included: a local non-profit agency for voluntary participants (Group 1), who earned continuing education units in exchange for their participation; members of a Child Development Associate recertification class (Group 2), who received class credit for their participation; and teachers at a local childcare facility (Group 3), who received a short workshop during their monthly staff meeting plus “music mentors” in their classrooms twice weekly. Each of Dr. Register’s experiential workshops covered: “…establishing a ‘musical routine’ appropriate instrument use, appropriate uses for recorded music, using music and movement, and singing through transition times” (p. 111). Participants received written materials and supportive props such as finger puppets and a kazoo. Participants knew that they would be observed at circle time in their classroom, at their convenience, one month after the workshop. All groups were surveyed about their use of music prior to the workshop trainings. With some slight differences of emphasis, the teachers listed the following uses of music in their classrooms: using recordings, singing a cappella, providing instruments as elements of fun during free play, playing calming background music, working on listening skills, and movement. This information is useful to music specialists in light of the encouragement from Haycock and Robinson (2001) to meet classroom teachers where they are before bringing them to the next level. Each group started out with 20 participants, but only 37 caregivers completed the study. This in itself is a telling measure of how much pressure childcare providers are under from every direction. Of the 37 full participants, only five returned the post-workshop survey and feedback forms. The returned forms allreported an increased ability to implement music in their classroom and a positive reception from the children. One has to wonder whether caregivers who failed to return their forms did so becausethey had a less optimistic experience to report. Also, the five teachers who returned post-workshop surveys stated that the most beneficial aspects of the workshop were instructions in using puppets, scarves, streamers, and using instruments paired with music. Music specialists who may be coming from a philosophical emphasis on pure voice and body will want to meditate carefully on what it takes to make less-experienced music-makers comfortable. One of the most promising aspects of this study was the use of music education students who were placed as “music mentors” in classrooms at the childcare facility where all of the Group 3 caregivers worked. In only one month, those caregivers increased their use of music at circle time from two to almost ten music activities, while the caregiver groups without mentors made hardly any increase. Note that for the pre-workshop number of music usages we are relying on the teachers’ self-report; Dr. Register acknowledges that future studies would be more powerful if they included objective observations before the training in addition to afterwards. Even so, the results were powerful enough for Dr. Register to conclude that “workshop experience without follow up support is not enough to effect lasting change” (p. 114). Group 3’s striking improvement can be attributed not only to the presence of student mentors in their classrooms but also to their level of teaching experience. On average, Group 1 had almost eleven years in the classroom, Group 2 had eight, and Group 3 had only seven. Group 3’s eager adoption of music activities seems to lend support to the previous findings by Ghaith and Yaghi (1997) that “…those teachers [who] are less experienced are more inclined to follow through with implementation of new techniques” (Register, p. 114). Music specialists might consider prioritizing efforts to reach teachers early in their careers, or may at the very least not be too dismayed if experienced teachers seem less open to our offerings. Within Group 3, however, various durations of teaching experience did not correlate significantly with how much progress individual teachers made. The striking, significant effect was the inter-group effect whereby all groups started the study offering their preschoolers two or three music experiences in a circle time, and only Group 3 increased their number of music activities to ten per circle time. Thus, the training effect of having “music mentors” in the classroom was more puissant than the effect of experience. But the experience effect still matters. The music education student “music mentors” had no prior early childhood experience and were given a mere two-hour pre-service workshop to ready them for their roles. Perhaps because this experience was offered to them so early in their careers, the students were very pleased with their learning in the placement. Dr. Register observed how much anxiety the Group 1 and 2 childcare providers evinced about being observed as music leaders. The study very subtly hints that the youth and inexperience of the “music mentors” might have relaxed Group 3 caregivers enough to be receptive and flexible. There were two factors that may have eased this experience for Group 3. First, all caregivers in this group worked at the same facility, where the employer valued appropriate risk-taking in the service of continuing professional development. Second, no “music mentor” was a lone so-called expert in the classroom: each was placed in a pair or trio of students who gave mutual feedback. This structure, chosen because of the students’ inexperience, may have, as a by-product, relaxed the classroom teachers: perhaps in seeing the students receive each other’s feedback, the caregivers’ anxiety about receiving and implementing feedback decreased. In summary, this study is richly thought-provoking and promising. While further research hones in more precisely on best practices, it may be in the best interest of children in childcare and early education situations if we music specialists provisionally: aim to serve all teachers within a single institution, provide them with ongoing in-class mentoring not just workshops, find ways to connect with teachers early in their careers or even before they enter the classroom for the first time, model receiving and implementing feedback eagerly, consider using music student interns as model learners, and “…[provide] training to classroom personnel and music education students simultaneously in order to build more immediate rapport” (p. 115). de l’Etoile, S. (2001). 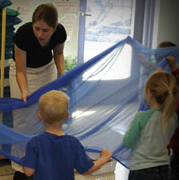 An in-service training program in music for child-care personnel working with infants and toddlers. Journal of Research in Music Education, 49, 6-20. Ghaith, G., & Yaghi, H. (1997). Relationships among experience, teacher efficacy, and attitudes toward the implementation of instructional innovation. Teaching and Teacher Education, 13, 451-458. Haycock, K., & Robinson, S. (2001). Time-wasting workshops? Journal of Staff Development, 22, 16-18.